A lens is a curved piece of ground and polished or molded material, usually glass, used for the refraction or focusing of light. 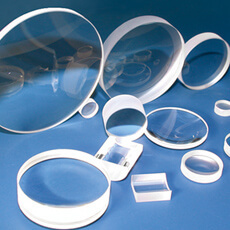 II-VI provides lenses a wide range of size and materials including BK7, Fused Silica, CaF2 and other glass types specified by customers. Similar to the cylindrical lens, spherical lenses are also widely used in the different applications, and II-VI provides singlets, doublets and customized lenses assemblies.